Second hand clothing and artefacts are everywhere in Berlin. Mostly prominent at the various flea markets around town there are also specialty second hand stores, both community run and privately where you can find some bargains. 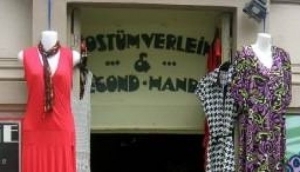 If you like to rummage through racks and crates of old clothes for classic individual, second hand pieces in a range of prices then check out the stores on My Destination Berlin’s second hand listing. You will find plenty of great bargains and at some stores you can even buy by the kilo!